It took several visits, hearty recommendations from Filipino folks, and a trip to Manila for us to understand the pleasures of La Mesa. Now it's one of our all-time favourite Sydney restaurants. We love to hit La Mesa at lunchtime, just after the lunch rush. There's usually a few tables of Filipino folks having a nibble and we love the sound of the happy chatter. With filtered sunlight through the north facing windows the place has a calming daytime ambience. Our first visit to La Mesa was back in late 2013, and while we enjoyed our meal, the clean accessible flavours didn't match the more full-on flavours we'd had in some hole-in-the-wall joints in like Fiesta Filipino, Funky Chicken, Mykababayan and Aunty Lo's Kitchen. We were kinda confused. We returned for a couple of lunch specials but still La Mesa still didn't click with us. Then we went to the Philippines for a quick taste-tester and suddenly it all made sense. La Mesa is very much like the mid-range restaurants we tried in Manila, where middle-class families visit in big groups and the flavours are a bit more modern and a touch less funky than the food we ate by the street. Since our trip to Manila we've returned to La Mesa a few times, hit upon some 'woohoo!' dishes, and now we are besotted with the place. 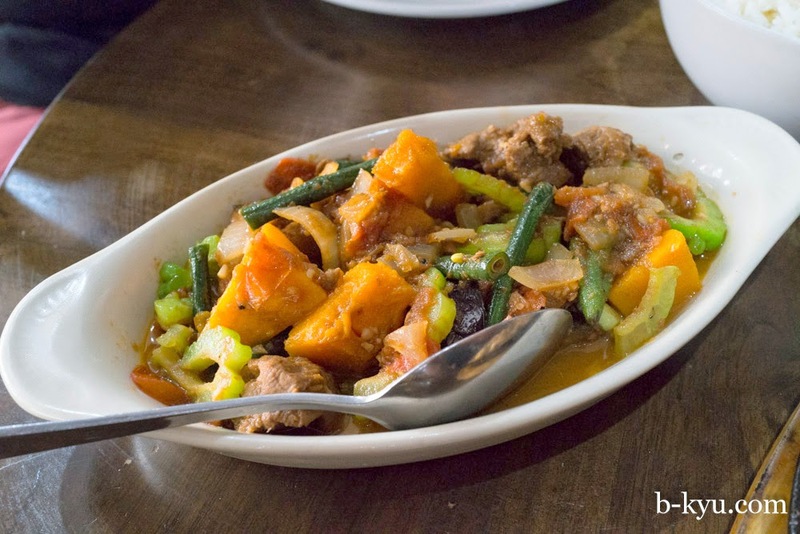 La Mesa's weekday lunch specials are an excellent place to start a Filipino food journey. 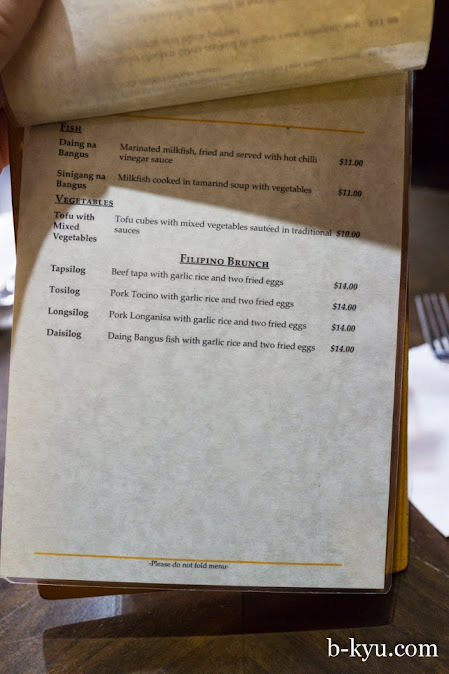 The lunch specials are around $11 and most of them are feel-good feeds with a nice balance of protein, rice and veggies. 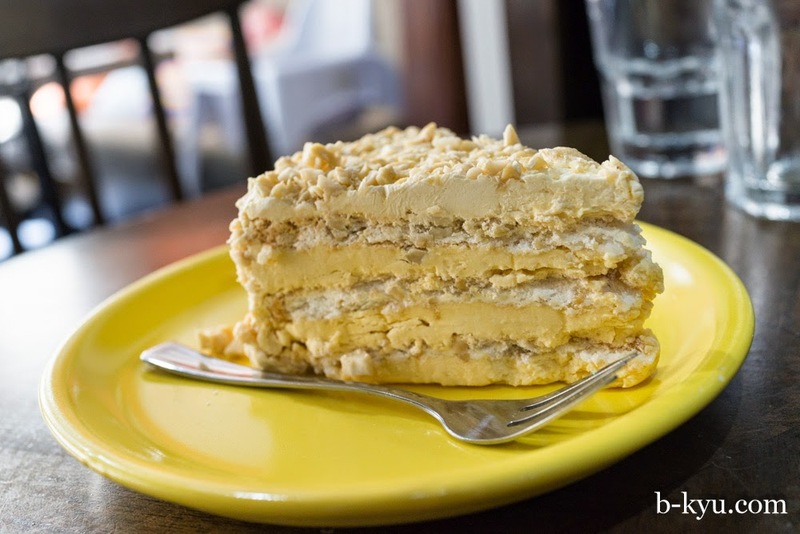 We also love to hit La Mesa when we feel like spending a bit more money, say $30-$50 each, and having something a bit more lardy balanced with one of those excellent Filipino veggie dishes, knocking back a couple of San Miguels, and maybe dessert. Filipino food is yet to hit the mainstream but the potential is there. Dishes like lechon (roast pork), inihaw (grilled meat), laing (taro leaves in coconut), adobo flakes (pulled pork/chicken stir fried until dry and crispy) and halo halo (shaved ice desert) - just to name a few - have broad instant 'wow' appeal. 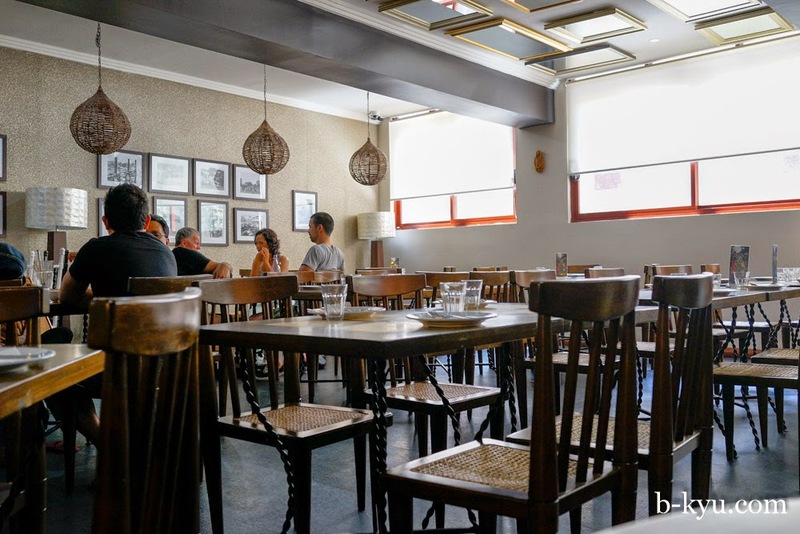 All it takes is the likes of a David Chang or a Dan Hong to cherry pick the cuisine, match a few cocktails then fitout a restaurant with a tropical hipster theme. In the meantime we're glad that Filipino food is our little secret, well you, me and a hundred million Pinoy souls. 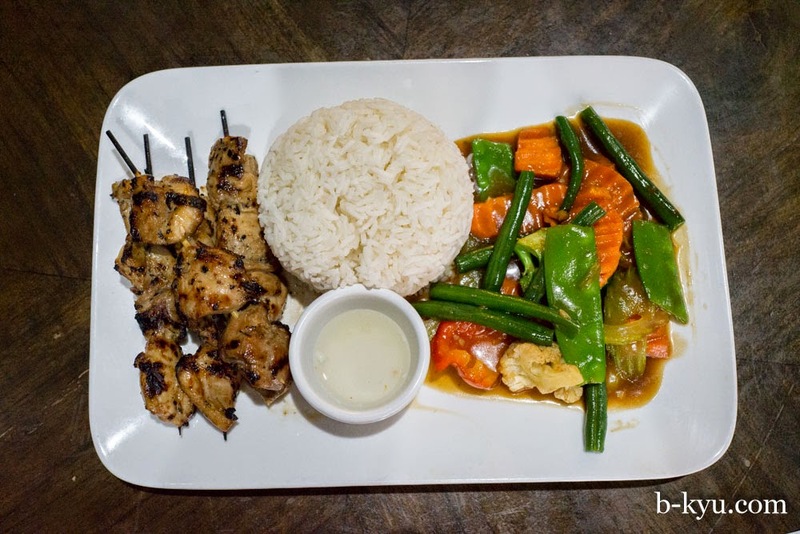 The Filipino restaurants of Sydney are few but unadulterated, enjoy them while you can. It takes a while to get your head around a new cuisine (this post was started in 2013) but it's worth it. La Mesa is a great intro to Filipino food, Fiesta in Blacktown is also an excellent (and cheap!) place to start. We hope to get to Sizzling Filo in Lidcombe soon. and calamari cooked in lemon grass, onions, garlic and ginger. 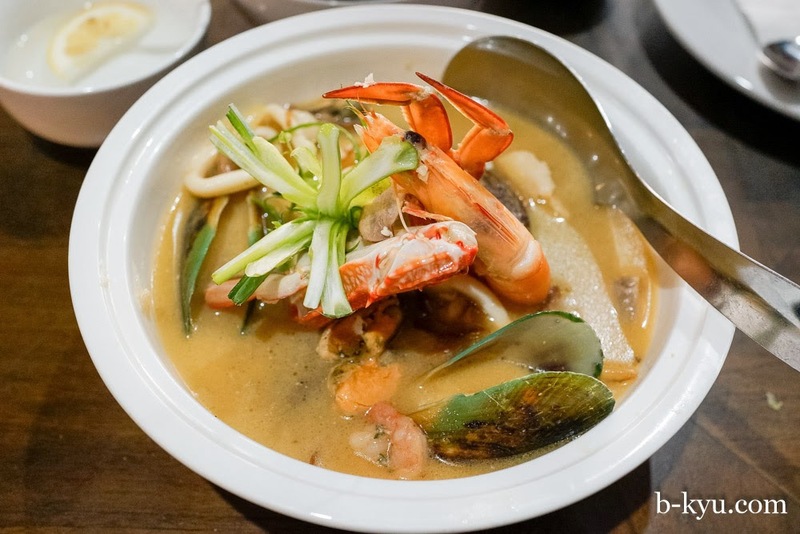 The soup is the eye-popping part of the dish: flavours from the seafood mixed with the spices, simple but wonderful. Ginisang Sitaw sa Baboy - $15. Long beans sautéed with tender pork pieces in garlic, tomatoes and onions with a hint of bagoong, Philippine shrimp paste. It reminded us of a Malaysian belecan (shrimp paste) dish but easier on the shrimp paste. Yay. Sizzling sisig - $19. 'Pig head parts' seasoned and and sizzlin' on a hot plate. The egg on top cooks as you mix it in. The flavour is uber porky with a funky offal-y note, the mix of soft and crunchy crackling textures are a marvel in the mouth. 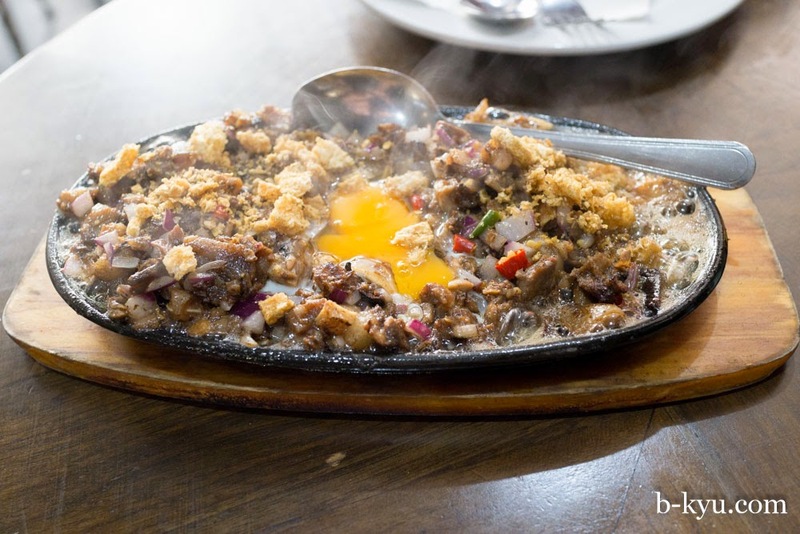 We tried sizzling sisig in Manila and this one is chunkier and funkier, bravo. We get some veggies to counter the rich lardy sisig. 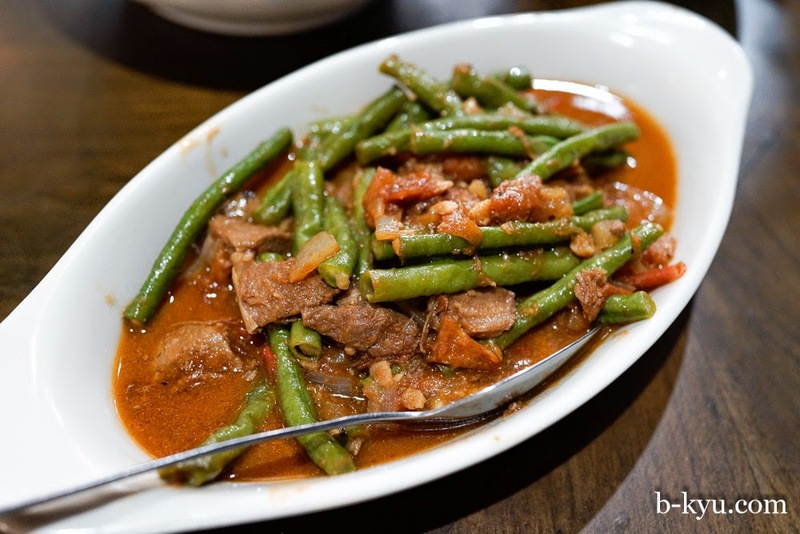 Pinkabet ($17) is a mix of eggplant, snake beans, garlic and tomatoes given oomph with Filipino shrimp paste (bagoong). And some hunks of pork for good measure, all veggie dishes need pork. We love this dish to bits. In our home cooking we are currently obsessed with the base of this dish: garlic, onions and tomatoes. Start a dish with this combo like you would with garlic, olive oil and onions in Western cooking, it's a winner. Filipino shrimp paste is a new favourite wonder-ingredient as well, a fresh, accessible change to the Malaysian belecan shrimp paste we usually use. There's still blood flowing through our arteries after the sisig so we order sans rival cake (about $7). And an ambulance. Sans rival cake is made of layers of buttercream and meringue, topped with nuts. It's rich and once slice is enough for the two of us. We first tried sans rival at the Funky Chicken in Mount Druitt, the texture was incredible but it tasted of margarine (gross). La Mesa's sans rival (from Gold Ribbon we think) tastes fantastic doesn't have that amazing Funky Chicken texture. If only we could marry the two. 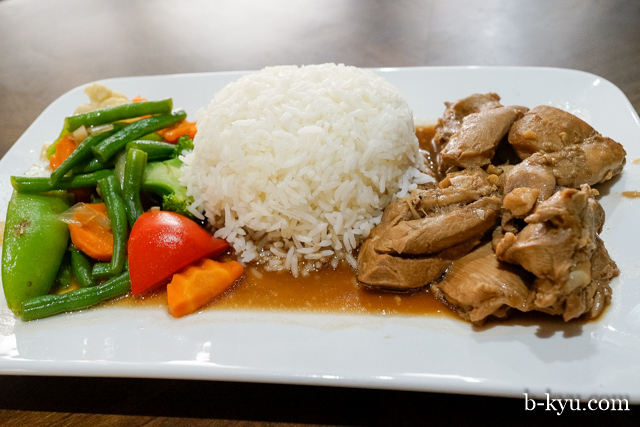 Adobo chicken - $11 (lunch special). Hunks of chook stewed in sugar, vinegar, soy sauce, garlic and black pepper. Served with stir fried veggies and rice. 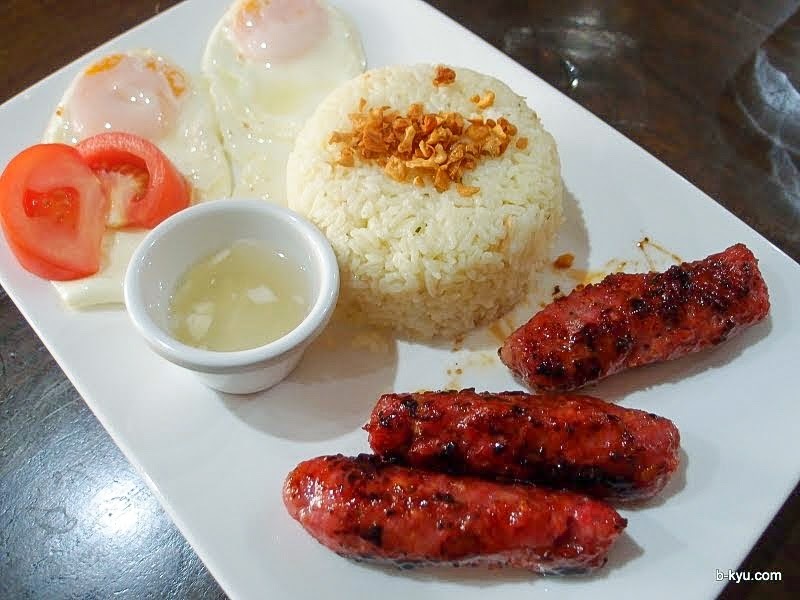 Longsilog - $14 (brunch special). These skinless pork sausages are punch drunk with vinegar and garlic. If that's not enough flavour, there's garlic rice and more garlic in the little pot of vinegar for spooning over the dish. Two yolk-soft fried eggs add a little more sauce to the dish. 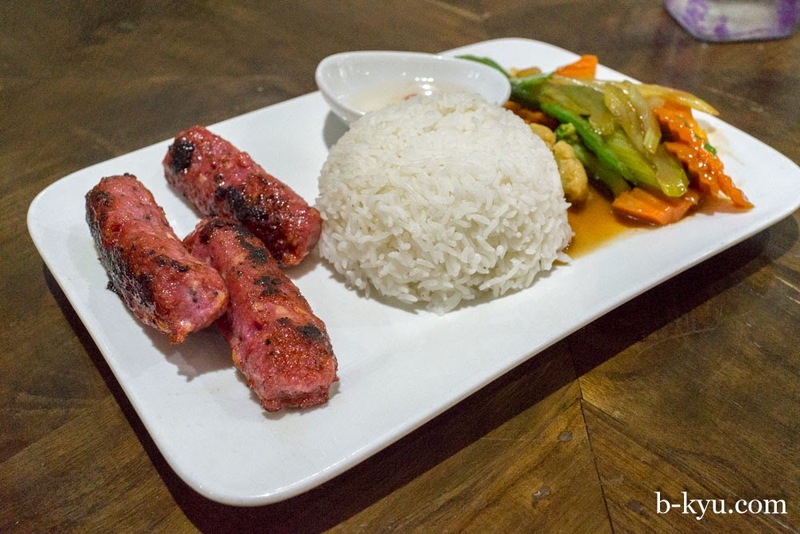 Longanisa - $11 (lunch special). The same awesome sausages from the longsilog but with plain rice and stir fried veggies, it's a little healthier. Those skinless porky Spanish inspired sausages are amazing, meaty and not-too-sweet with some lovely spice notes we couldn't identify. Longsanisa is pretty good naked but it's amazing when dunked in the garlic vinegar. 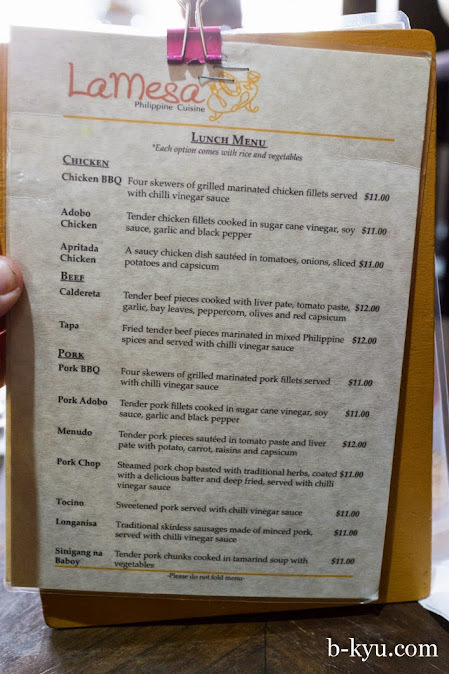 Chicken BBQ - $11 (lunch special). Mr Shawn didn't find these chicken skewars overly exciting but plain-eaters may dig on them. 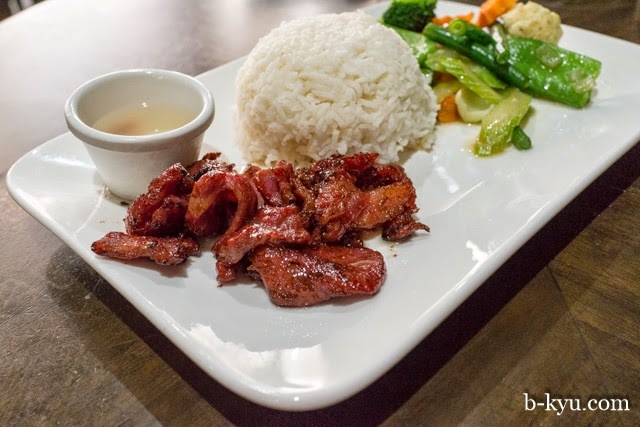 Tocino - sweetened pork with chili vinegar sauce - $11 (lunch special). Tastes like an intense char sui (Chinese BBQ pork) with some crispy caramelisation on the edges. It's good on it's own but rather wow-ish with a good splash of the sauce which is wisely served on the side. The vinegar has a sweet/sour funky hit, just enough chili to give it some edge. 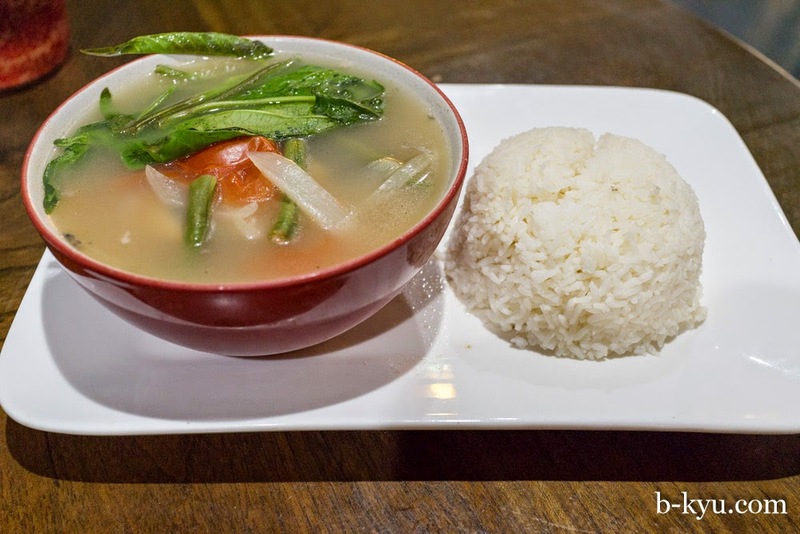 Sinigang na bangus - $11 (lunch special). Milkfish cooked in tamarind soup with vegetables. This is one of those soups that is plain on first sip but grows on you more and more as you get through the bowl. It's like a delicate tom yum without the chili, clean with a light fishy kick. Mr Shawn was surprised how much he enjoyed the milkfish, it has a hearty bite and isn't overly fish, reminding him of tuna when cooked this way. The couple of fish hunks go well with the eggplant, beans, onion and Chinese greens. This is a healthy, refreshing soup, highly recommended to fellow soup nerds. Love adobo, didn't even know this place existed!